The election of current Italian Prime Minister Matteo Renzi to the position of the secretary of the Democratic Party (PD) in December 2013 swept SAIS Europe economics professor Filippo Taddei into a brand new job. Under Renzi, Taddei became the Chief Economist of the Democratic Party (PD). Taddei assumes his new role at a critical time for Italy’s economy. Per capita GDP in Italy has fallen by 9% between 2008 and 2013, and in December 2013, only 55.6% of the working age population had jobs. This is well below the Eurozone average of 68%. The country has also faced sluggish to zero growth in recent years and, according to the International Monetary Fund, the Italian government’s gross debt is above 130% of its GDP. With Italy’s flailing economy among the country’s most urgent concerns, Taddei will facilitate the coordination and design of the country’s new economic policy by bringing together expertise from top Italian scholars, social partners and government officials. Italy’s economic woes has meant a decrease in foreign investment and diminished global confidence in Italy as a place to do business. Important firms that have historically boosted the Italian Economy, such as Fiat and Swedish Electrolux, are ready to leave the country to operate in more stable, dynamic economic environments. Italy is also now in the novel position of attracting foreigners to help spur growth and productivity. “We want Italy to go back to being where it used to be… [and] not just a nice place to visit, but the perfect location to build things,” Taddei said. Yet the country’s struggles should not eclipse the Italian economy’s strengths, which go far beyond food and fashion, Taddei said. Italy has a dynamic network of firms involved in high-tech industries that will play a major role in the future global economy. It has become a leader in mechanical industries and the biomedical sector. And Italy is continuing to engage in other up-and-coming markets as well. “We are entering markets such as robotics or 3D printing by extending our economic system and building on some of the deepest strengths of our current productive structure,” Taddei said. Addressing the faltering economy is a top priority of the Renzi administration. However, Taddei noted that among the greatest challenges of the job will be balancing public expectations and the urgency of reforming Italy’s economy with the need to implement effective carefully-developed policies. As for his role at SAIS Europe, Taddei sais his new opportunity will only strengthen his contributions to the school and students. “I think that some real life experience at the top end of the political game will be useful for a school in international affairs that is naturally focused on policymaking,” he said. And students agree. “It is exciting to have such a powerful person in the Italian economy right here, teaching us as he is implementing real reforms around us,” said Robert March, a first-year student at SAIS Europe. 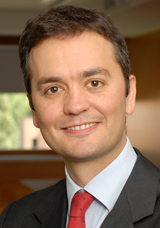 Likewise, Taddei believes his teaching experience offers a unique perspective and special skills to his government responsibilities by “providing intellectual discipline” to his policymaking.